Constantine I AE follis, Lyons mint 330-335 AD. 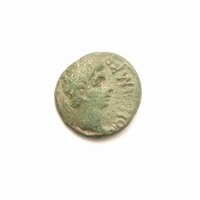 Obverse: CONSTANTI-NVS MAX AVG, rosette-diademed, draped and cuirassed bust right. Reverse: GLORI-A EXR-CITVS, two soldiers holding spears and shields with two standards between them. Star PLG in ex.